Here's an easy no-bake recipe that I shared on a guest post that I did a while back. It's perfect for this time of year because it requires no baking whatsoever...nada, zip, zero...none! 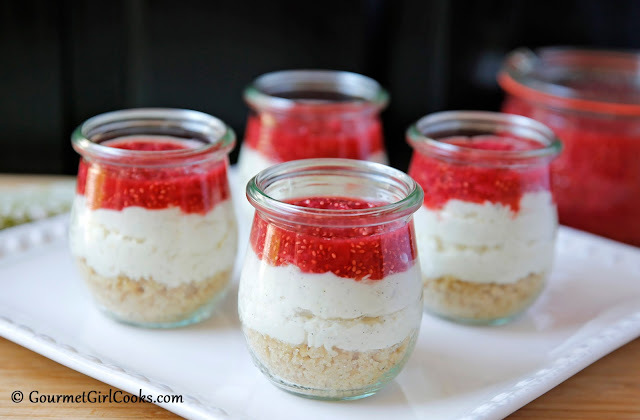 My No-Bake Strawberry Mascarpone Dessert Cups are a healthier and updated, more gourmet-ish version of the old Strawberry Pretzel Salads of yesteryear (which aren't even a salad to begin with...I mean WHO refers to a dessert as a "salad")! For those that don't know what a "strawberry pretzel salad" is, it's a salty-sweet crust made using crushed pretzels, topped with a no-bake cheesecake-type filling and a final layer of strawberry gelatin and strawberries. Once again, it's a dessert, NOT a salad! It's a delicious, cool, no-bake dessert to help you usher summer out with a bang! To make these extra special, I made them in my cute little Weck Tulip Jelly Jars, but you can make this in a square cake pan as well and simply cut into squares to serve. 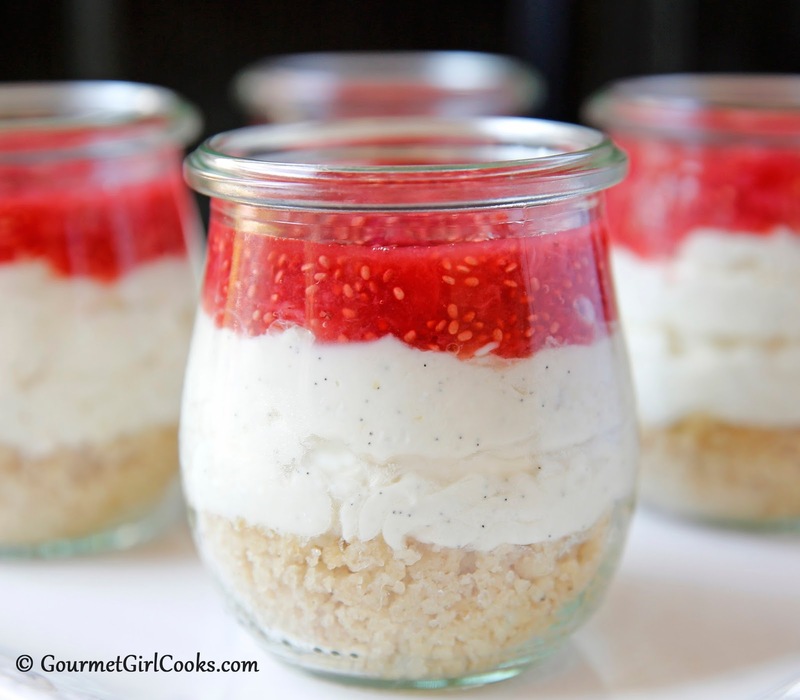 Check out my photos for No-Bake Strawberry Mascarpone Dessert Cups below. 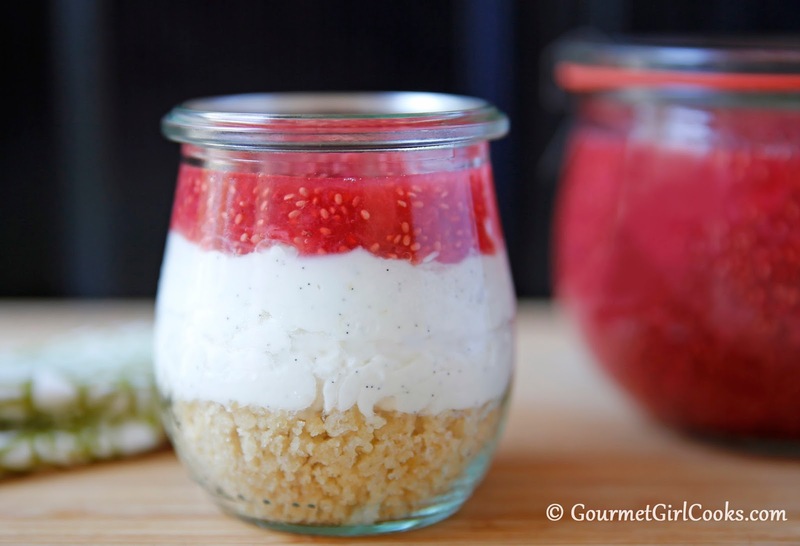 They have a salty-sweet nut flour crust to take the place of pretzels; it has a to-die-for sugar free vanilla bean mascarpone and cream cheese filling; and it's topped with my Strawberry Chia Jam. It is "knock your socks off" good! The recipe is listed below the phots. Enjoy! In a medium bowl, combine almond flour, ground walnuts, 1/3 cup sweetener, and salt. Add melted butter and cut in with a pastry/dough cutter or fork until crumbly. In a separate bowl, beat together mascarpone, softened cream cheese, sour cream, heavy cream and 6 tablespoons sweetener until smooth. Scrape seeds from vanilla bean into filling mixture and add lemon zest; stir until evenly blended. Divide crust mixture between 6 “6 to 8-ounce sized” custard cups or ramekins. Lightly press or tamp down until packed tightly. Divide cheese filling among custard cups and spread snugly to the inside edges of custard cups. Chill for about 1 hour or until cheese filling is firm. 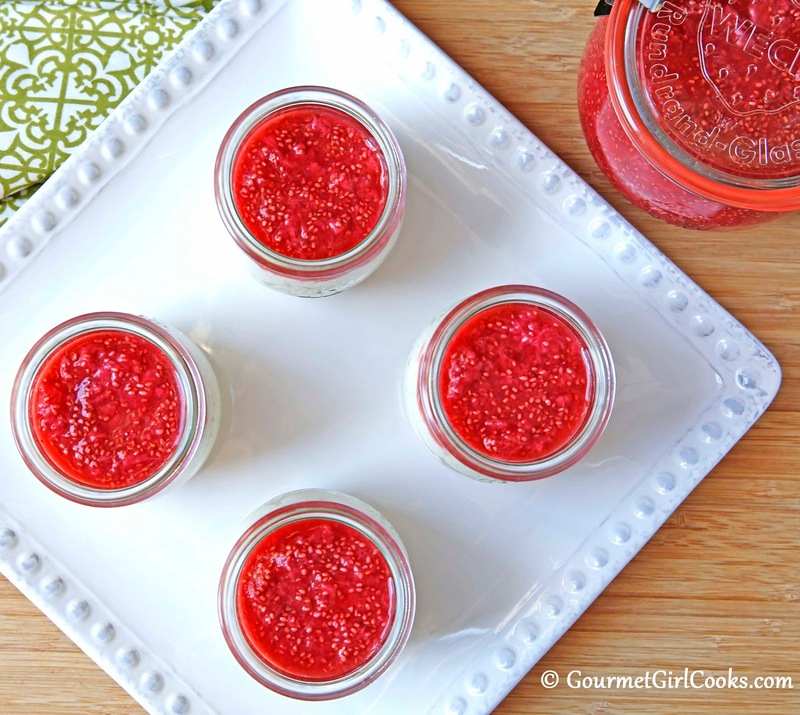 Top with strawberry chia jam and chill until ready to serve. *Notes: If desired, mixture can be layered in an 8-inch square pan and cut into square to serve. If topping with fresh sweetened strawberries instead of jam, add them at serving time. Do you ever grind your chia seeds so they are less "obtrusive" in things? Do they work as well for a thickener if ground? I tried making a pudding once and I just couldn't get past the chia seeds in it and wondered if they would work ground. Yes, when I bake with chia seeds, I grind them. I've never added ground seeds to a non-baked dish though but I'm sure you could try it. I would use less though than the whole seeds. Grinding increases the volume.